Vueling €30 off discount coupon code 2019! Vueling sent us great gift for all our fans – €10-€20 promo code for selected Vueling markets which can be discounted from your purchase. The new Vueling discount code entitles you up to €20 discount for return flight in 2019. There are only 2000 vouchers for each country, after this amount has been applied the discount will be disabled. Travel dates for this Vueling promo code are until 31st December 2017 with Summer (until 13.9.) and Christmas (21.-31.12.) blocked. You have to book return flight and this flight has to be at least 21 days ahead of booking date. This Vueling promo code works for all routes and destinations in Vueling network until 18th February 2018. Vueling informed us about brand new €10 off promo code. This Vueling promo code works for all 90 destinations served by the airline. The discount code is valid for 4 days until 3rd September 2017 for return flights operated by Vueling. Travel dates are limited from 10th September until 5th November 2017. Vueling sent us a new €20 off voucher code! This voucher code works for .DE market, all departures should be from Germany. The discount is 20 Euros on Basic & Optima tariff for round trip, booked minimum 21 days in advance. Vueling informed us about their brand new Valentine promotion where you can get €30 off from your flight tickets! To get this massive discount from the base price you have to travel in group of 2 people. The discount only applies to the base fare, it does not include airport taxes or supplementary services. 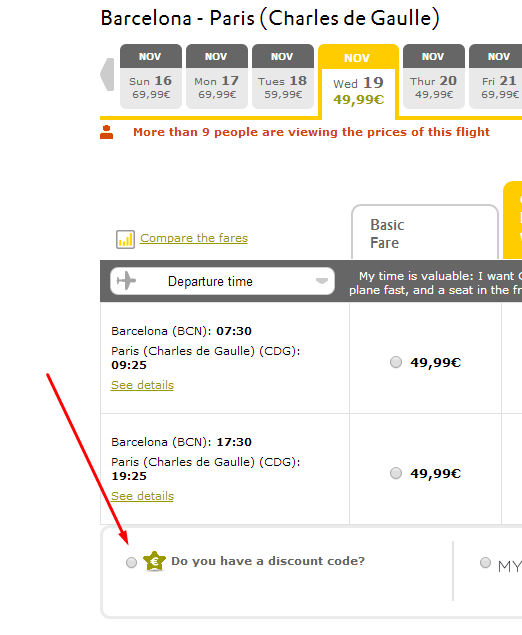 How to apply this Vueling €10/€30 off discount code? 1. Find the “Do you have a discount code” field at the end of Step 1. 2. Enter the discount code according to the country of departure from the list above. 3. Confirm the code and you will see the updated price. Don’t forget you have to book a return flight to get the discount. Vueling Airlines, S.A., styled as Vueling is a Spanish low-cost airline based at El Prat de Llobregat also known as Barcelona El Prat airport with hubs in Barcelona–El Prat Airport and Leonardo da Vinci–Fiumicino Airport in Rome, Italy. Its name derives from the Spanish word vuelo, which means flight. 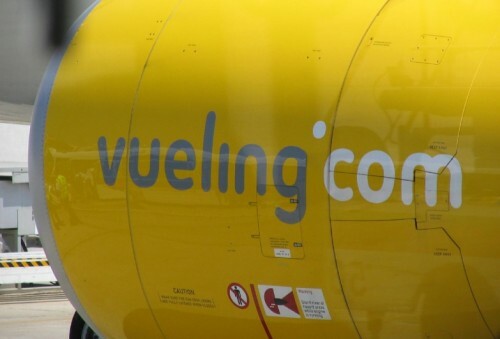 There are 13 more Vueling bases at A Coruña, Alicante, Amsterdam, Bilbao, Brussels, Florence,Madrid, Málaga, Palma de Mallorca, Paris-Orly, Santiago de Compostela, Seville and Valencia. Vueling also operated additional summer seasonal base in Ibiza. Vueling flies to over 100 destinations in Africa, Asia and Europe and is currently the second biggest airline in Spain. In 2014, the airline transported more than 17.2 million passengers. Vueling’s official website can be visited at Vueling.com. Enjoy your discounted flight with Vueling! Check also our other promotional codes: Iberia promo code, Kiwi.com discount code or AIR ITALY promo code.